Air Duct Repair La Crescenta is a trusted name in the area of air duct repair, service and maintenance. Healthy indoor atmosphere is getting important everyday because of the use of decrepit material in the installation of air ducts and vents. The staff we employ is professionally trained and certified in dealing with air duct repairs. 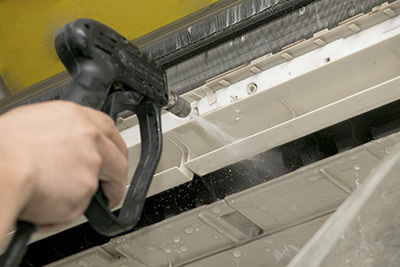 We use a unique process which involves the duct sealing injection system. This system was exclusively designed in the labs of a well-ranked and highly esteemed university. Before the repair procedure our technicians run a specially designed diagnostic test which is aided by a computer system to inspect the premises and to find faults. With the help of the report generated at the end of this test we communicate to the client the potential problems with their system regarding damages and leaks in the air ducts. This system bypasses the process of opening walls, ceilings and floors which is very costly, time consuming and difficult to manage. But this does not mean that we charge our customers anything extra, on the contrary we offer our services at very affordable prices. Our way method of working makes sure that the indoors are less dusty, humidity inside is reduced and automatic exhaust facility provides hot and cold air when required throughout the house with uniform efficiency. Assessment of the need of the customer through our unique diagnostic test is something that we value very much. This analyzes the inner and outer air pressure and the air supply in a given room. A separate test is run to identify whether air is being sucked back into the house through the furnace or some other means. After the tests, the report obtained is analyzed by our staff and discussed with the customer to propose a feasible solution to the problem. All the registers are closed off when the process is started. After sealing the system in every possible manner the injection machine is attached to the ventilation system. Particles which are adhesive in nature are emitted through this machine which identifies spots which have leakages. These particles cover these holes and spots so that the air duct system is leakage free. After the procedure just described a certificate is generated by our computer regarding full proof sealing. This report gives a comparison and highlights the condition of leakage before and after the operation. This is the whole process which is used by our company to repair air duct systems and satisfies almost all the customers. The only difference between us and others is that we have experienced professionals who know how to do their job and do it in a way that the customer is satisfied. We make sure that all our practices are in-line with industry standards and comply with all the local and national laws. The machinery and equipment used by our staff is the best of the best that is being used in this field these days. The chemicals and materials used by us are totally safe and eco friendly. The importance of a well maintained and clean air duct system is highlighted by the fact that a number of diseases related to breathing have been reported in recent times and the number keeps on increasing. One of the reasons for this is that the majority of the time of an average individual is spent indoors.